Your “Keeping It Real” dietitian is changing things up a bit – instead of posting about a food product that I love, I’m going to post about a workout that I love! With New Years resolutions in full force, many people that I know have decided that they want to take up running or get back into running this year. Every year running is part of my personal goals. I would have never enjoyed running as much as I do if it weren’t for the Couch 2 5k training program. You can find the original Couch 2 5k plan that I started years ago right here. Get yourself some good running shoes! When I first started running, I was just using some “running shoes” that I bought at Kohl’s. I ended up with some pain in my foot that may have been the beginnings of plantar faciitis. I learned my lesson and decided to go to a real running shoe store where they analyzed my gait and helped me pick out the best shoe for me. When I started running on those new shoes, I felt like Forrest Gump when he busted through his “magic shoes”. I could run better, faster, and best of all without any pain. Get comfortable running clothes. I did not know for a long time that cotton (t-shirts) is the worst thing you can wear to workout in. You don’t have to buy super expensive workout clothes, but look for something that is “moisture wicking” or a polyester blend. They tend to be the most comfortable. Also be sure to dress appropriate for the weather, and don’t be afraid of layers. You’ll be amazed by how much you warm up while you are running, and you may want to shed a few layers if you’re running during the colder times of the year. Don’t be afraid to start on a later week in the program if you already have some running experience under your belt. When I originally started the program, I had already been able to run a mile without stopping, so starting from the beginning felt too slow for me. I started on week 3 of the program, which was a perfect place for me to start. If you’ve already been running, try starting on a later week and see how you feel. Don’t be frustrated if it takes you longer than 9 weeks. I re-started the Couch-2-5k plan I don’t know how many times. There were times when I would repeat the same week’s workouts for several weeks in a row because I just wasn’t comfortable moving on. It is really okay… it is a great guideline, but you need to do what your body tells you to do. Don’t be frustrated if you can’t run a full 5k when the training is over. When I did the program, I went by time, not distance. And as you know, I’m not a very fast runner. So for me, running for 30 minutes straight wasn’t quite getting me to a 5k. I ran/walked my first four 5k races, so don’t be frustrated if you can’t run the whole race. It’s all about FINISHING! Train with a friend. I had a friend that ran with me in college, and it always made it more fun. Practice running outside before your first race. If you’re planning to do the training on a treadmill (and I don’t blame ya if you live somewhere with weather anything like Michigan this time of year… BRRR!) make sure you get a few workouts done outside before you run your first 5k. Running outside is so much different than on a treadmill. I personally cannot stand the treadmill, so I do my indoor running on a track, and my outdoor running wherever. Even running on a track is much different than running on trails or sidewalks, so make sure you do a few training runs on a similar surface to what you’ll be running the day of the race so you know what to expect. Make an awesome playlist… but keep in mind that you may not be able to have music when you run a race. Certain races don’t allow headphones because they want you to be as alert as possible to your surroundings. I love running with music, it helps me to stay motivated and pumped up for my workout, but I have had to go without at certain races. You may want to practice running both ways so that if you unexpectedly can’t have your favorite playlist for your race, you’ll know what it is like to listen to your own breathing and footsteps. Consider downloading an app to your phone to help with your training. I have the official Couch 2 5k mobile app to help with training, and I love it! This app guides you through the training based on time (not distance). It uses GPS if you’re running outside to track your distance. You’ll have a coach that keeps you motivated. You can set it up so that it will vibrate when it is time to switch from jogging to walking or vice versa, or just having the coach tell you. For me this made a huge difference because I wasn’t a slave to watching the clock or distance. I just did what it told me to when it told me to, without constantly looking at a watch to make sure I switched intervals appropriately. 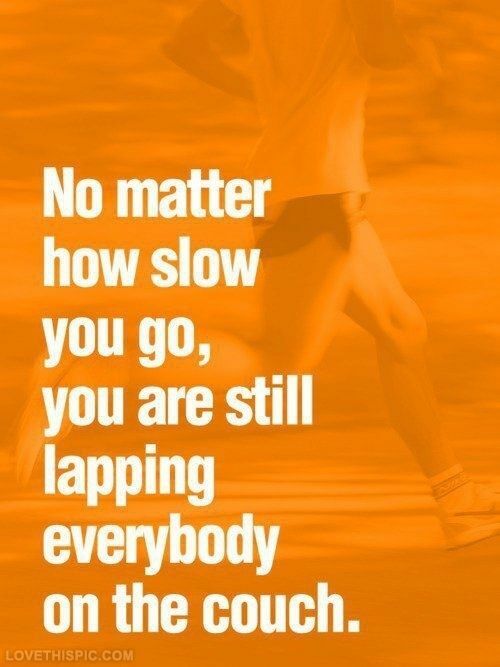 Pick a 5k race and STICK to it, no matter what! I had a race in mind when I started the Couch 2 5k, and even though I didn’t technically complete the program before the race day came, I still did the race. Like I said earlier, it doesn’t matter if you run/walk the whole race, what matters is that you finished.